T-Shirt Bags! Affordable plastic shopping bags. Many colors. Logo / printing available. T-Shirt Bags! Affordable plastic shopping bags. Many colors. Logo / printing available. Custom printed t-shirt bags with handles offer great value for your business. 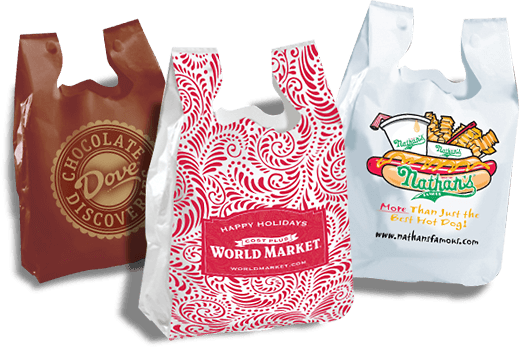 An affordable choice for mall stores, restaurants and other retail businesses, t-shirt bags offer durability and functionality. Available in a range of sizes and colors, they can be branded with your logo or message. Today’s plastic t-shirt bags are more environmentally friendly than ever; some are 100% recycled content. The strap handles provide excellent carrying strength. T-shirt bags fit standard bagging stands for quick point-of-sale use. Because of their low prices, these are always a best seller with our Atlanta and Savannah customers. Available in Super Satin® (HDPE #2) and Super Frost® (HDPE #2) materials. Super Frost® frosted translucent bags are available in standard, premium and select colors. If you need plain bags in a hurry, feel free to contact us about our quick shipping options. Minimum order is one case — 500 or 1,000 bags depending on size.